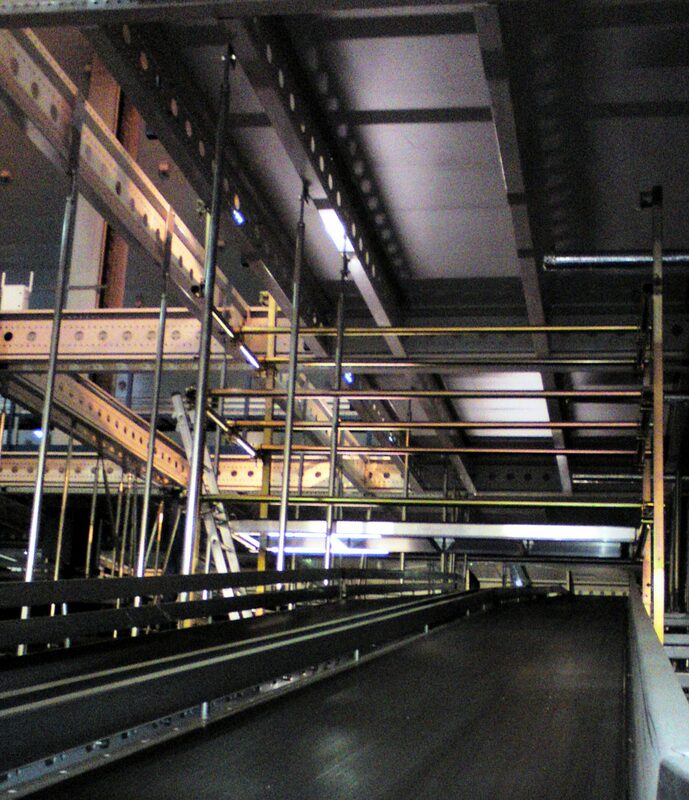 Warehouse logistics and material handling system solutions require planned and reactive maintenance programs, often in elevated areas. The movement of goods in a distribution or manufacturing operation requires sophisticated automation systems. The higher the volume of movement the greater level of complexity required. Material flow solutions using pallet or case conveyors, AGVs, and monorails are a highly effective means of moving goods between work areas. They offer real time tracking of goods and added value tasks; for example wrapping, weighing and the sorting of goods. 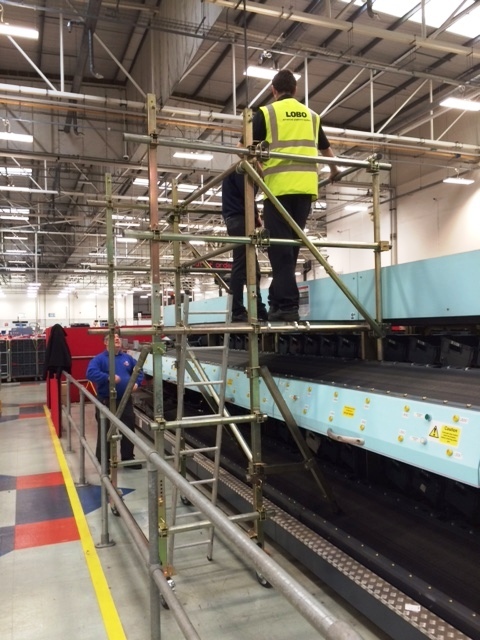 Maintenance is key to an efficient process, many areas are awkward and therefore difficult to reach, each task often being different from the last. 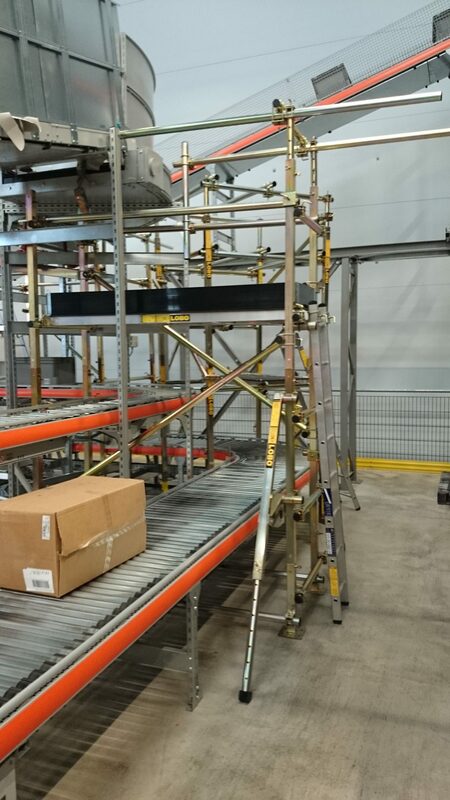 Working at height must be accomplished safely and, traditionally, outsourced scaffolding companies and fixed aluminium tower systems have been deployed. 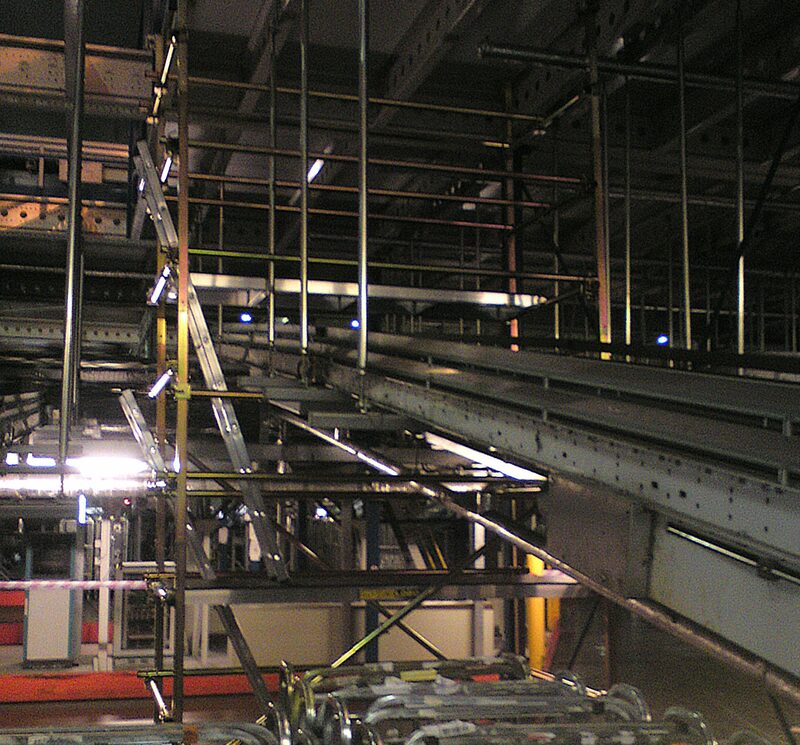 Outsourced scaffolding labour is expensive and not available 24 x 7, aluminium frame systems are cumbersome, inflexible, difficult to transport and will not adjust to fit into awkward areas. 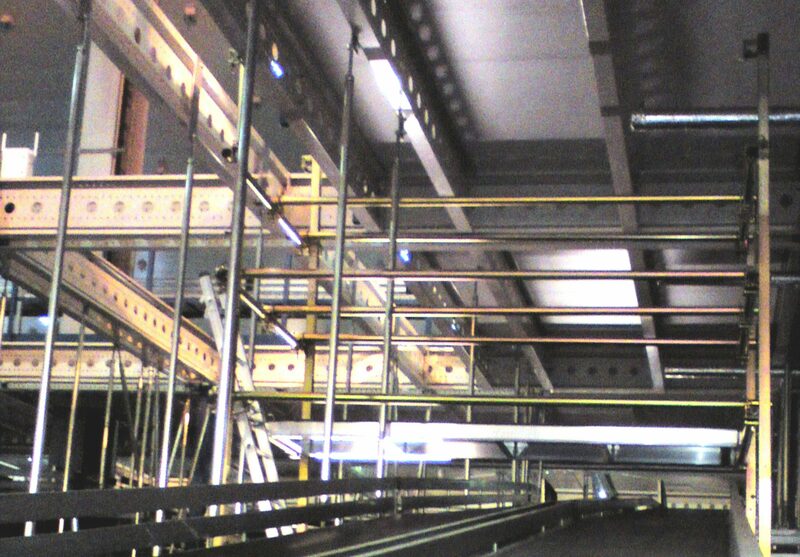 Using a LOBO Work Platform System solution can dramatically improve logistics system operation by reducing scaffolding labour costs, which in turn will improve service levels and increasing operator productivity. 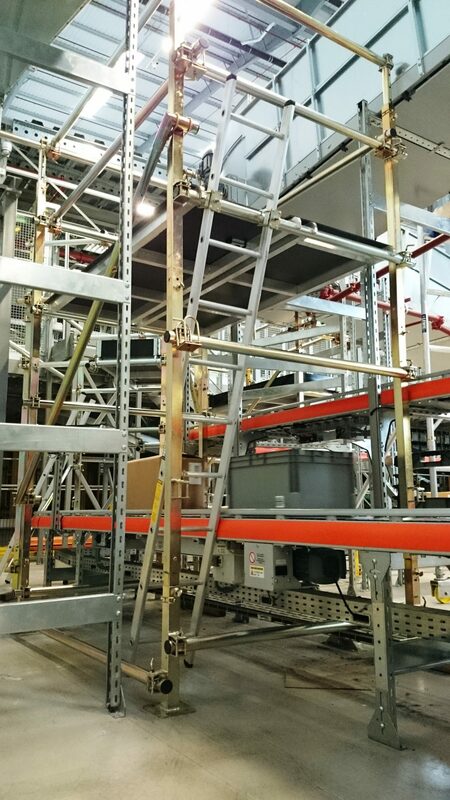 The LOBO Work Platform System can be assembled quickly, easily and safely around and above desks or restricted access areas by your own in-house maintenance crew. This means out-sourced scaffolding labour costs can be reduced without compromising safety. Areas, previously considered difficult to get to can now be accessed with ease for maintenance and cleaning purposes. In addition, The LOBO System is available 24/7, putting Managers in control of how and when they schedule their maintenance tasks. a) LOBO scaffold is scalable, adaptable and adjustable to meet your on going and changing requirements. Simply add more components or alter your existing configuration to satisfy the demands of the next task. Protect your initial investment with a product that will meet all your access needs safely! b) LOBO access is a rigid and stable product, which meets or exceeds current safety regulations. Handrails can be fitted in seconds, at any point in the erection process. c) LOBO’s steel scaffold structure ensures many years of product life and a system that will not shake or rattle. The system also can include a slider lifting beam kit and a Towerstore storage unit. d) LOBO’s modular scaffolding approach means components fully integrate and can be hand carried. Fully constructed systems can also be made mobile by the addition of wheels. 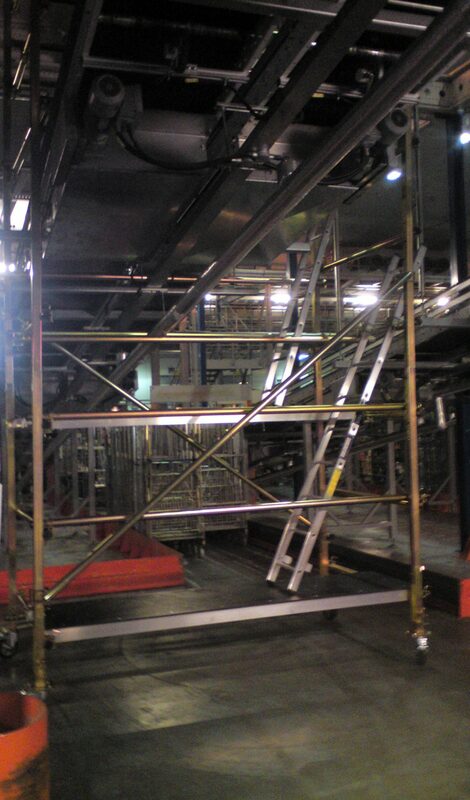 Experience shows that deploying the LOBO Work Platform System reduces the costs associated with hiring scaffolding and constructing bespoke access systems. By reducing or completely removing your reliance on out-sourced scaffolding and engineering companies cost savings will be achieved – easily in a 12-month period! Available 24/7, quick to erect – and above all, safe – it is immediately adjustable for your next job with no staff waiting time while new fixed-frame structures are built. Re-configurable, again and again, this access system comes with no disposal costs and minimal replacement and on-going training costs. Dematic, FKI Logistex, Marks & Spencer, Ocado.